The 2016-2017 Providence Friars have an identity this year, and that identity is defense. They recently just moved into the top ten in scoring defense in the nation and that got me thinking…how come the Friars have taken such a step forward defensively this year? Just as an FYI, all of these stats are from games through December 18th. 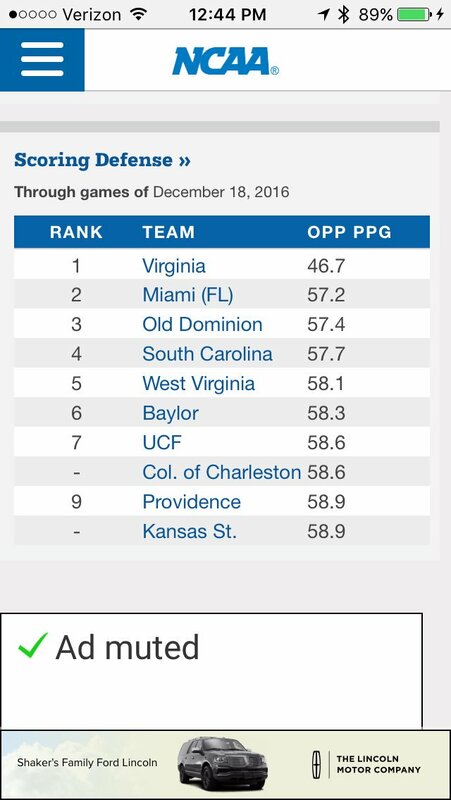 When I first started thinking about the Friars having a top ten defense in the country, it didn’t make sense to me. The team lost the two-time Big East Defensive Player of the year to the NBA Draft in Kris Dunn. Dunn was fifth in the country last year in steals with 2.48 per game but PC was still only 109th in steals per game as a team. They also lost an above average defender in Junior Lomomba who transferred and Ben Bentil to the NBA Draft as well. Even with all of that, Providence was still just 129th in the country in scoring defense last year, allowing 70.1 points per game. Now, for as much as Kris Dunn was an elite defender in college (and he definitely was), it was off-set a little bit by his very high propensity for turnovers, averaging 3.52 per game. So for as much as Dunn was able to take the ball away from the other team, he pretty much returned the favor throughout the game. Kyron Cartwright on the other hand, may not have the size, length, or theft ability of Kris Dunn, but he is much better at taking care of the ball. Cartwright actually had the best assist to turnover ratio in the Big East last year, so with more time with the ball in his hands this year, the Friars turnovers have decreased, all while Cartwright climbed all the way to 4th in the country in assists with 8.0 per game. As for Ben Bentil, I think that most of the scouts in the country would have agreed with calling him a minus defender last year. I think that’s a little unfair to a guy that was playing out of position at Center when he’s really a Power Forward and really wasn’t something that he could help. Bentil was a little light and small to guard the larger centers and not quite fast enough to guard the wings if the other team chose to go with a smaller lineup. While Ben did have great north to south speed, he wasn’t quite up to the task in lateral quickness. Even when someone tried to drive on Ben, he could keep up side-by-side but his change of direction speed was a little awkward. With a smaller and thin lineup last year (amplified by the late transfer of Paschall Chukwu to Syracuse and ineligibility of Alex Owens), the Friars obviously didn’t get a ton of blocks. They were 147th in the nation with 3.61 blocks a game. Put it this way, when Rodney Bullock is leading your team in blocks, you’re probably not getting a lot of blocks. The Friars didn’t get bigger down low as Emmitt Holt is roughly the same size as Bentil last year. The one thing he does have on Ben is that he moves laterally extremely well and while Ben was more of a thunderous block specialist, Holt is more of a disrupt your shot and stuff you kind of guy. Holt’s approach is much more sound defensively. So what is it exactly that got the Friars from being 129th in scoring defense last year to a top ten defense this year? What are they doing so well for them to be this good? They’re once again playing smaller and are tied for 148th in the country in blocks with 3.6 per game (basically the same as last year). Being undersized, they’re not going to overpower you with rebounding either, ranking 298th in the country (33.64 per game). Without Kris Dunn, their steals have come down and they are tied for 182nd with 6.4 per game. So it’s definitely not blocks, rebounds, or steals. I think we can agree on that. So what are some of the stuff they’re better at? They take care of the ball. With Kyron Cartwright at the helm, the Friars are tied for 52nd in the country in Turnover Margin (+2.9) and 57th in Assist to Turnover Ration with 1.29:1. They also turn their opponent over at a good rate, forcing 15.09 turnovers per game, good for 83rd. But their forte? Three-Point Defense. The Friars are 11th in the country in 3-Pt Field Goal Defense. Their opponents are shooting just 27.9% from three point range during a time when teams are shooting more three point shots then ever before. Since more shots are being taken from beyond the arc, the need for a traditional center isn’t as big of an issue as it may have been in the past. For what the Friars lack in girth, they make up for in length and quickness. Take a look at their starting 2 through 5. They also have Alpha Diallo (6-7) and Ryan Fazekas (6-8) coming in off the bench. All six of these players can switch on defense, making it extremely difficult for the other team to get separation on the outside. Although the group doesn’t block a lot of shots, they all get a hand in your face and challenge shots with their length. That’s where this team really excels, in their ability to be able to adapt with interchangeable parts on defense. Although a ton of their other team statistics don’t immediately jump out at you, if you look at what the teams playing PC are doing against the Friars compared to their season averages, you’ll see what Providence is really doing to suffocate these teams. The Friars are holding their opponents to 13.7 point per game less than their season average. They’ve actually held 7 of their 11 opponents to double-digits below their average points scored per game. They are also holding their opponents to an average of 3.6% below their FG percentage and 2.7% below their 3-point percentage. To top it all off, they are forcing 1.78 more turnovers per game then what their opponents usually make. Providence College is holding their opponents to a very respectable 40.4% this year on a very balanced team. Last but not least, the Friars are ranked 23rd in KenPom’s adjusted defensive efficiency this year which measures the team’s points allowed per 100 possessions, adjusted for opponent. The Friars will need to ride their defense as far as it can take them once things get a little tougher when the Big East conference games start and let’s hope that turns out to be pretty far.